Gutter color is usually an afterthought for many homeowners when they’re deciding on what kind of repairs or remodels they want to make. The truth is that gutter color matters! A carefully-selected gutter color can accentuate certain features on your home’s exterior and veil the ones you aren’t particularly fond of. Decide on what to accentuate. Most design experts recommend matching the color of your gutters to the roof or the trim of your house. If the trim of your house is wide, it’s suggested that you match the color to the trim. If the trim is skinny, match your gutter color to the roof. If you’re looking to accentuate your home’s base, try picking a color that’s similar in color to your front door. This creates clean lines and highlights the front of your home, including the landscaping. Choose a workable color palette. 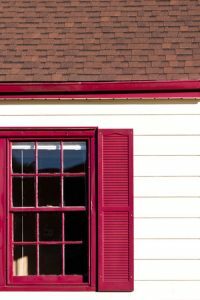 Red-colored gutters typically work with brick exteriors and red-tiled roofing. For a more earthy tone, brown and beige colors work extremely well. These neutral tones match any roof, and are often paired with rustic architecture. Light gray gutters complement homes fashioned in the style of Cape Cod architecture. These American cottage styles look sleek with gray, and choosing this gutter color may provide a small but modern update to your classic-looking home. Most people choose white or off-white gutters because it’s the standard factory color choice and to be honest, most people don’t know they have an option in gutter color! They may think they have to match their trim to their gutter system, but you can do the opposite. Looking for a modern update? Check out our selection of gutter colors and find one that suits your home’s style. When word of a rain or thunderstorm is coming your way, it’s time to spring into action and take the necessary steps to protect your home. 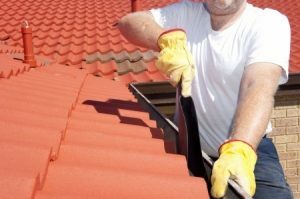 All homeowners know there’s a lot of work that goes into taking care of and keeping up a home, and the gutter system is no exception. By being preventative and taking some precautionary measures to make sure your gutter system is in tip top shape before a storm, you are saving yourself time and money in the long run, avoiding preventable repairs. The key is making sure your gutter system is up to the challenge of what the storm may bring and keeping your home dry. Follow these easy steps to ensure your home stays dry during your next storm. It’s important to initially inspect your gutter system, including your gutter guards and downspout, to assess the condition of the system. Timing between when you dust off the latter and when the storm is anticipated to arrive is key. Safety should strongly be taken into consideration when making this call. Ideally, you would time it out that it’s on the same day of the storm before it hits, but you need to balance not doing it too far in advance and too close to the storm. Remember, if it seems dangerous or you are unsure for any reason, it’s better to hold off. As you inspect your gutter system, keep an eye out for any loose bolts or screws and tighten them as you go. The more secure your gutters are before the storm, the better suited they’ll be when it comes rolling through. Clean your gutter system, including the downspout. Make sure you do a thorough check to ensure the system will work properly, free from any obstacles. To ensure the downspout is clear, spray a hose at a high pressure through the top and bottom. If there are any clogs, a plumber snake should do the trick. If you find any major issues during your inspection, it’s time to call in the professionals: a gutter repair specialist. For more information about gutter systems and their maintenance, visit Bell Seamless Gutters. A lot of debates have occurred over whether or not you need gutters on your home. Some people say that you can go without them and other people say that you should not. We believe that gutters are a necessity when it comes to home maintenance. We encourage everyone to have gutters on their home to avoid major issues down the road. In order to understand why you need a gutter it is important to un derstand exactly what purpose they serve. A gutter is a long tube typically made of aluminum that wraps around a home. 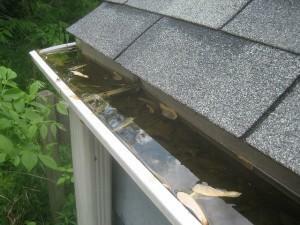 The gutter collects rain water as it pours down the surface of the home. 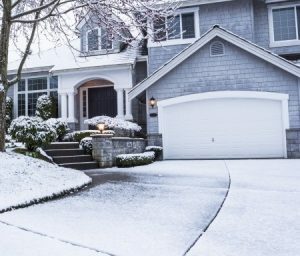 The water then falls down through the gutter and eventually pours out of the gutter and onto the ground to keep the water from reaching the foundation of the home. As a result, the ground surrounding the house does not become drenched with water, keeping the foundation dry. If you did not have those gutters around your home, the amount of water and moisture that would surround our home would quickly damage the foundation of your home. Water would get into the structure of the home which would cause cracks, breaks, and instability within it. Water can cause significant damage to the roof and siding of the home as well if it is repeatedly soaking them or seeping into crevices. If water does reach the structure of the home, it can also cause condensation which can cause wood around the home, such as window frames, to rot and mold. Although gutters can be expensive and definitely require some maintenance, we believe that gutters prevent more damage from occurring to the home. Maintaining your home is vital to avoid spending money on unnecessary projects down the road. We believe that gutters are a necessity to keeping your home well-kept.